Looking for fun things to do in Utah and Arizona? Along the border of the neighboring states, you’ll find incredible and diverse landscapes, from the soaring cliffs of Zion National Park to the narrow passageways of Antelope Canyon. Miles of desert give way to vibrant rivers, and deserted roads lead to famous parks with millions of tourists. It’s not all about the scenery though. In the region of northern Arizona and southern Utah, there are a dozen or so national parks, forests, monuments and recreation areas packed with activities. With so much to choose from, it may be hard to narrow down what to do, but these seven bucket list experiences are a great starting point for your adventures. Larger highways have since replaced the historic road, but you can still drive portions of it, where you’ll find everything from ghost towns to tourist attractions that play on its popularity. In Arizona, Interstate 40 has largely replaced the route, but sections of 66 on the western side were bypassed by the highway, leaving behind a trail of abandoned gas stations and lodgings. Driving southeast from Las Vegas on an Arizona road trip, you’ll want to veer off the highway in Kingman to hop on 66. The next 100 miles are mostly deserted, with scattered houses, a handful of open diners and the colorful Antares Point Visitor Center featuring the quirky “Giganticus Headicus,” a big green art piece vaguely resembling the Easter Island statues. Another 20 or so miles from where I-40 merges back up with 66 near Ash Fork, it splits briefly again in Williams, the last town in this region bypassed by the interstate, and a tourist hub of shops and hotels, thanks to its proximity to Grand Canyon National Park. This itinerary will help you plan a one-week road trip in Arizona. Visiting the Grand Canyon should definitely be on your Arizona bucket list, but hiking below the rim is especially spectacular. 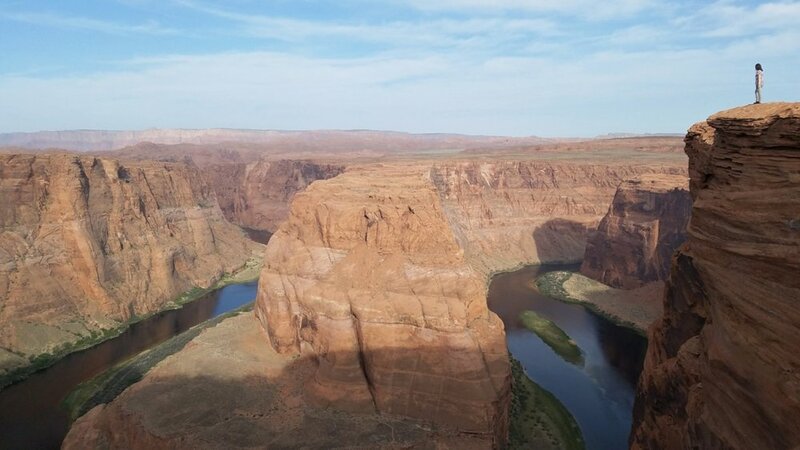 Twisting some 277-miles along the Colorado River, the canyon runs a mile deep, and with careful planning, you can travel all the way to the bottom on a multi-day excursion. Even daytrippers and casual hikers can make their way down a couple of miles, though, on South Rim trails like the Bright Angel or South Kaibab, which have several vantage points to pause at along the way. Choose a distance to suit your physical abilities, as hiking hundreds of feet back up from a turning-around-point can be taxing and take twice as long as walking down. On the South Kaibab trail, Cedar Ridge at the 1.5-mile point is an ideal destination for a day hike, with about an 1,100-foot elevation change on the way to an open flat spot perfect for picnicking. Bring lots of water, snacks and sun protection for hikes in the Grand Canyon. Summers get very hot and there’s little shade along these trails. Built to harness the Colorado River in the 1930s, Hoover Dam was the largest in the world at its completion, and remains an engineering marvel. Designated a National Historic Landmark, it draws millions of visitors yearly to the Nevada-Arizona border for sightseeing and tours. You can drive or walk along the top to snap photos of the vibrant blue waters brushing against rocky walls, where a white ring marks the highest water levels of the past. Onsite there is a visitor center and exhibits, and you can tour the dam or the powerplant if you purchase a ticket. Dam tours are popular and tickets can only be obtained upon arrival, so getting there at opening is essential to secure a spot during the busiest times (like summer, holidays and weekends). 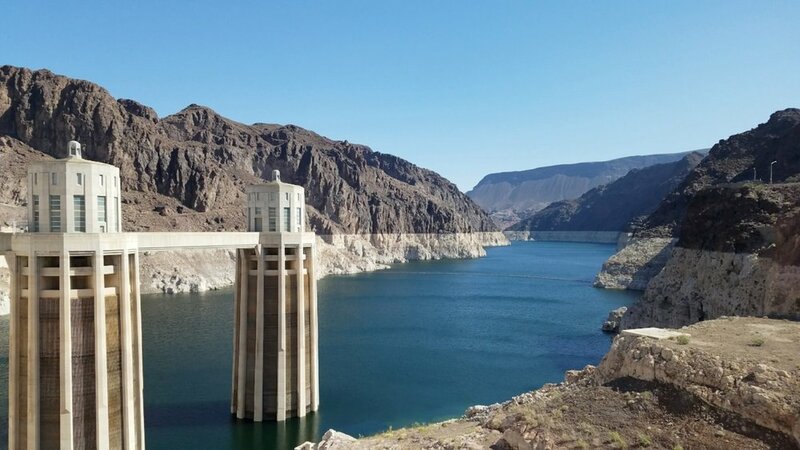 Formed by the dam, Lake Mead National Recreation Area offers all sorts of waterfront activities, from boating, fishing and swimming to hiking and biking. 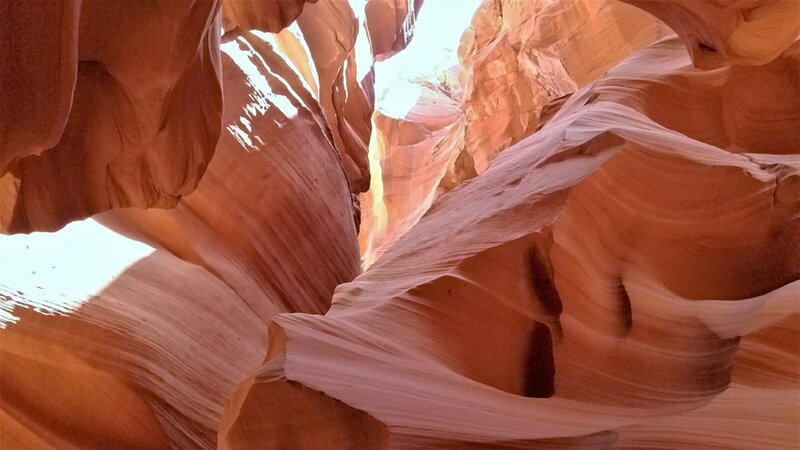 Smooth canyon walls rise hundreds of feet above your head as you walk through the narrow corridors of Antelope Canyon. Located on Navajo land outside of Page, the slot canyon begins at Antelope Creek, near Glen Canyon Dam, and runs for miles inland. The sandstone passageways are formed by erosion, with floodwaters carving flowing patterns through the rocks and smoothing jagged edges. In summer, sunlight sneaks in from the ceiling above, shooting down in the form of picturesque light beams. 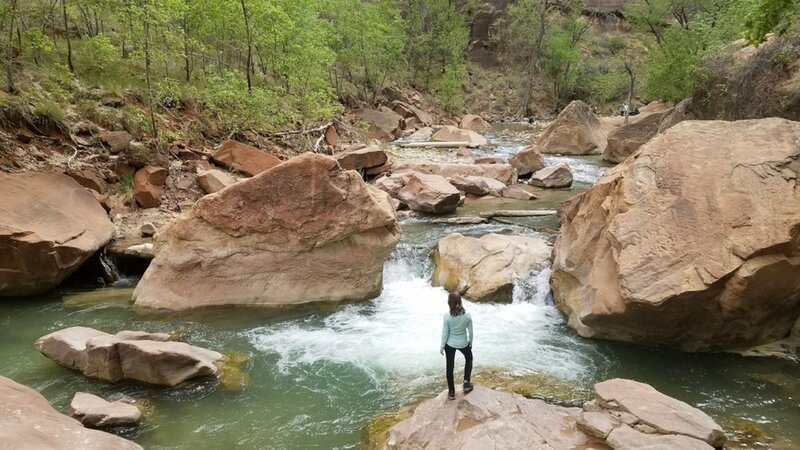 Guided tours are the only way to visit this natural wonder, as the potential of flash flooding makes the canyon dangerous to hike in on your own. The two most popular sections to see are the Upper Antelope Canyon and Lower Antelope Canyon, but if you’re after a more intimate excursion, the less crowded Antelope Canyon X tours take you to a different section that is just as scenic. North of the Grand Canyon, the Colorado River makes a dramatic U-turn at Horseshoe Bend, near Page, Arizona. You can hike to a lookout point here for breathtaking views of the hairpin twist, where blue-green waters slice through the canyon walls. In recent years, the fascinating site has gained traction on social media and become one of the top things to do in northern Arizona. Since the observation area faces west, sunsets here are particularly dramatic, albeit a crowded time to visit. Fortunately, there are still plenty of spots along the rim to escape the crowds, if you’re willing to carefully walk along the rocks to more isolated points away from the trail. The path from the parking area to the river view is about 1.5 miles round trip, but can be tiring thanks to sandy hills you have to trudge up and down and a lack of shade. Some resting pavilions have been added to aid with the latter, but you’ll still want to protect yourself from the sun and bring water, especially in brutal Arizona summers. The world’s largest collection of hoodoos can be found at Bryce Canyon National Park in Utah, where a contrast of green pine trees and orange rocks jutting up from a canyon floor makes for a striking image. The hoodoo rock spires formed by erosion take on some odd shapes, given names like “Thor’s hammer” and “Queen Victoria” for the characters and objects they resemble. Looking around at the thousands of pillars is a bit like playing the cloud shape game. While standing high above the amphitheaters at the Rim Trail observation points grants excellent views of the hoodoos en masse, wandering down to the bottom allows you to get up close to the strange figures. Several paths drops below the rim, ranging from the easy Queen’s Garden trail, which descends 320 feet, to more strenuous options like Peek-A-Book Loop, which goes all the way to the canyon floor at a steep decline. Zion National Park is one of the top places to visit in Utah – and for good reason! Giant red mountains here rest against bright blue skies, a vision from both the top of the canyon (accessed via a short walk on the overlook trail) and the bottom, which you can easily reach by car. Even the drive into the park from the east is incredible, with switchbacks and tunnels through the sandstone hills. The park has a number of trails to tackle, uncovering everything from waterfalls and pools to steep, rocky ledges. One of the most popular and unique experiences, though, is walking through the Virgin River on The Narrows hike. The path begins alongside the river, but after about a mile, you have to wade and trudge through the water to continue. In places, the trail is only 20 to 30 feet wide, with canyon walls soaring hundreds of feet high on either side. It goes on for several miles, but you can only go 5 miles in (10 miles round trip) on a day hike without a permit. Since the trail is the river, the slippery rocks, swift currents and flash flood threats can be hazardous, so planning ahead and being cautious is essential. Local shops like Zion Outfitter rent out dry gear, footwear and hiking poles to aid the trek. Ride the Grand Canyon Railway from Williams, Arizona, to the South Rim of Grand Canyon National Park. Visit the Mighty 5 Utah national parks – Zion, Bryce, Canyonlands, Arches and Capitol Reef. Bunk at the Bright Angel Campground at the bottom of the Grand Canyon. Hike to Havasu Falls or the Wave in Arizona (permits are in high demand). What are your favorite things to do in Utah and Arizona?